For decades, the Golden Isles on Georgia’s coast have been a draw for vacationers. Superb golf, miles of beaches, great vacation lodging and the natural beauty of Georgia’s barrier islands all attract visitors to the area. Whether it’s the allure of the historic Jekyll Island Club or the old-school experience of the new Holiday Inn Resort, generations of families gather here for ocean-side excursions in a pristine natural setting. While the county suffers from a shortage of land that qualifies for development under the current environmental parameters, voters passed a Special Purpose Local Option Sales Tax (SPLOST) last year that will raise about $72 million for expansion or improvement of infrastructure, including roads, drainage, sewer and water projects. Unfortunately, it’s not always sunny in the Golden Isles. Hurricane Matthew was not kind to Glynn County when it blasted ashore last October, but it wasn’t the catastrophic 500-year event some predicted either. With many residents evacuated and barrier islands Jekyll, Sea and St. Simons closed to the public, the storm blew across the Georgia coast, downing centuries-old trees and damaging property. The barrier islands were hardest hit, as expected, and remained closed for several days as electricity was restored, workers cleared the roads of downed power lines and trees, debris was removed and flooding subsided. All in all, the area was fortunate not to have been harder hit, says Brunson, adding that the county spent about $16 million on cleanup. A silver lining following the hurricane, Jekyll Island was able to construct 13 new clay tennis courts at the Tennis Center because the old courts were severely damaged in the storm, says Jones Hooks, executive director of the Jekyll Island Authority. But long before Hurricane Matthew, concerted revitalization efforts were taking place on Jekyll Island, from new hotels and restaurants to spruced up public areas and parks. Investments of more than $170 million have financed private and public projects since 2008. Additional projects totaling $52.3 million are in progress, including the $2.8-million entry corridor and the $4-million North Shore Beach project for shoreline erosion control, with another $79.4 million in projects still planned. Visitors are responding well to the improvements, and traffic counts have increased from just over 900,000 in 2013 to 1.14 million last year. Among the newcomers for lodging, the Jekyll Ocean Club – part of the Jekyll Island Club resort – opens this summer, offering 41 suites. A Home2Suites by Hilton, with about 100 units, is planned for a parcel immediately west of the Westin, says Hooks. The 1958 Wanderer motel was stripped to its concrete shell and $16 million invested to create the fresh 155-bed Holiday Inn Resort just steps from the beach. Now welcoming its third year of summer vacationers, the family-oriented property is also dog friendly, a big plus for many travelers. The Beach Village is fully leased, and this month Global Concessions of Atlanta, owner of Jekyll Island Seafood Co. on the international concourse at Hartsfield-Jackson Atlanta International Airport, will open its flagship restaurant there, says Hooks. “One of the issues we’ve had in Jekyll is there have been limited places for folks to eat, so we’ve been working on that,” he says, noting four additional restaurants have either recently opened or will open this summer. New offerings include a full-service restaurant in the Jekyll Ocean Club, Zachary’s River House at the marina, and a poolside restaurant at the Jekyll Island Club Hotel. One project is particularly interesting, says Hooks. Latitude 31, a restaurant on the historic wharf, was damaged in Hurricane Matthew and the lease sold to the Northview Hotel Group, which last summer also acquired a majority equity interest in the Jekyll Island Club Hotel. Latitude 31 is being renovated and will reopen this summer as The Wharf. Also breaking ground is a new museum, the Jekyll Island MOSAIC: The Island. The People. The Legacy. The existing museum will be transformed into a state-of-the-art education center and cultural institution, says Hooks. The Jekyll Island Foundation raised more than $3.1 million for the project. Finding that balance between revitalization and the necessary preservation and conservation efforts is crucial, he says. With a total of 180 holes to be played, many visitors come to the Golden Isles specifically for golf. Aspiring pro players have migrated to the area to play and train, and nearly a dozen established golf professionals call the area home. St. Simons and Sea Island offer three courses each, the city of Brunswick two and Jekyll Island four. The popular sport is currently a draining operation for Jekyll Island, which has had to subsidize the golf offerings with profits from other operations. The authority recently commissioned a study by the National Golf Foundation to hear recommendations for how to move the courses out of the red and back onto the green. “While we certainly see a lot of people come to Jekyll to play, other years we have not spent the money on capital improvements for the golf courses that we would like to because there’s just been no money available,” says Hooks. It’s also been a timing issue, he adds. Over on Sea Island, a major shift in ownership occurred last summer, says Scott Steilen, president and CEO of Sea Island Co. Back in 2010, four investors bought Sea Island out of bankruptcy for $212 million. In 2016, Colorado businessman Philip Anschutz gained sole ownership of Sea Island by buying out three co-investors. Recent projects at Sea Island include expansions at two restaurants, Tavola and River Bar, as well as meeting space at The Lodge. They’ve also added a 39-foot Contender fishing boat. “It allows us to get out to the Gulf Stream far more expediently than in the past and far more comfortably than in the past, two key elements for a successful fishing trip,” says Steilen. Sea Island will take delivery late this year or early 2018 of a new cruising yacht that will ultimately replace the Cloister Belle, offering larger capacity and providing opportunities for cocktail cruises, daily cruises and group cruises. 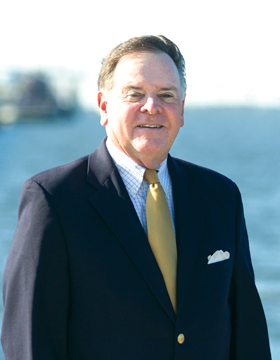 Luring good jobs to the area is an ongoing challenge for Glynn and the five surrounding counties. Together, these six make up the Southeast Georgia Joint Development Authority (SEGAJDA), which recently unveiled the results of an extensive analysis of the area’s workforce, says Mel Baxter, executive director of the Brunswick and Glynn County Development Authority, adding that the regional work- force study was presented to about 40 project managers in Atlanta. Bringing new jobs to town is the main goal of Travis Stegall, Brunswick’s new economic and community development director. Since his arrival via Decatur the first of this year, he’s initiated Be Social, a small business initiative to help promote startups and encourage the early success of individuals with low incomes who are interested in starting a business. He’s also established some partnerships to provide funding for those interested in becoming a certified nursing assistant (CNA) or earning an associate’s degree in early childhood education, two areas in need of qualified workers in Glynn County. “The goal is to take individuals being paid eight or nine dollars an hour and bring them up to about 15 bucks an hour,” says Stegall, regarding what he calls “low-hanging fruit initiatives” that can be accomplished quickly. Most would agree providing that crucial workforce begins with a solid education. Glynn County is home to not only a public school system, but also a four-year college and a technical college, all working in conjunction to educate students and create a desirable workforce for current and potential employers. The Glynn County School System is in the midst of building or renovating nearly every school, thanks to the county’s penny sales tax, half of which is paid by tourists. “We’ve been in a huge building phase,” says Mann, regarding the results of three Education Special Purpose Local Option Sales Taxes (E-SPLOSTs) that have pumped about $300 million into school system projects since 2008. Through the passage of E-SPLOST 3 in November 2015, Glynn County hopes to raise about $130 million over four years to complete a long list of building projects to serve the county’s 13,500 students. Currently, Glynn Academy Athletic Complex is being constructed on 10 acres on Lanier Boulevard near Glynn Middle School, made possible through the assistance of a $1-million donation from a former Glynn County student athlete, Adam Wainright, a baseball player with the St. Louis Cardinals. The complex includes a regulation baseball field, a regulation Title IX softball field, a walking track for the community and a football field that will serve as the home field for Glynn Middle School. Last month, construction began on the new Burroughs-Molette Elementary School, a $26-million project and the system’s first geothermal elementary school, an energy- and money-saving system that uses the earth’s temperature to heat and cool the building. Non-bonded projects, which will only see completion if revenue goals are reached, include a 1,400-seat, $20 million Coastal Community Center for the Arts through a partnership with College of Coastal Georgia. With tourism and job creation accelerating and emphasis on a trained workforce, the Golden Isles’ economic benefits continue to shine. In 1778, Glynn Academy was chartered by an act of the General Assembly. Nearly 250 years later, it still operates as a public school in Brunswick, where it was the only public school building for a half century. Though Glynn Academy was chartered in 1778, the original school building wasn’t constructed until 1819, at a cost of $10,000. Funds to create the school were raised through the sale of town lots by eight men appointed Brunswick commissioners by the General Assembly. For more than a century, the school included all grade levels, even if its classes were small – records show the graduating class of 1888 included four girls and two boys. Now, it serves as one of two public high schools in the county, with more than 1,600 students attending in 2016. Two-time Ryder Cup Captain Davis Love III, who has called Glynn County’s Sea Island home for the past 30 years, is among the notable alumni. It’s the sixth-oldest high school in the country, says Glynn County School Superintendent Howard Mann, a proud 1979 graduate of Glynn Academy. The school is the second oldest in the South, after the Academy of Richmond County in Augusta. It’s the only one, however, still serving students in its original location. The original building was replaced over time, including a wooden schoolhouse in 1840. That one was dismantled, moved and rebuilt in 1915 in nearby Sterling, where it served as a school for African-American students and later as a community center. In 2008, the structure was returned to the Glynn Academy campus and is reportedly the oldest wooden schoolhouse in Georgia and the second oldest in the country. Along with the schoolhouse, now known as “Alumni Hall,” the Glynn Academy campus is home to six buildings on two city blocks, including the c. 1936 Sidney Lanier Building as well as the Prep Junior High School building constructed in 1909. It’s been said that a tunnel connected the two buildings at one point but has been closed in, says Glynn Academy Principal Scott Spence, who has tried to find evidence of the tunnel. “I think it’s probably somewhat a myth,” says Spence, who has ventured beneath the buildings in search of the rumored passageway. When asked what possible use such a tunnel might have had, he suggests it was likely a safety feature prompted by the Cuban Missile Crisis in the 1960s.